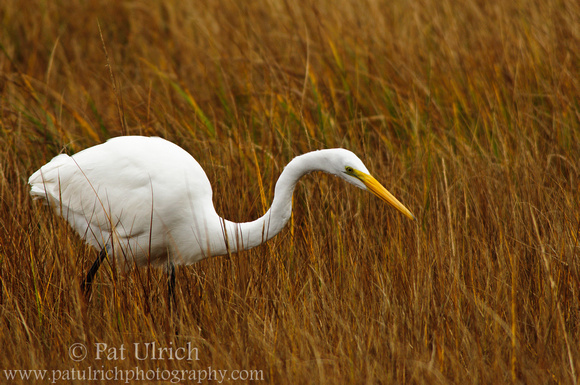 There's something so elegant about watching an egret or heron hunt, as they gracefully slide through the marsh in search of prey. Their movements are so even and controlled, that is, until they strike out after whatever morsel has caught their eye. It never ceases to amaze me how efficient these birds are at hunting. It seems like they must catch something 8 or 9 times out of 10 attempts. 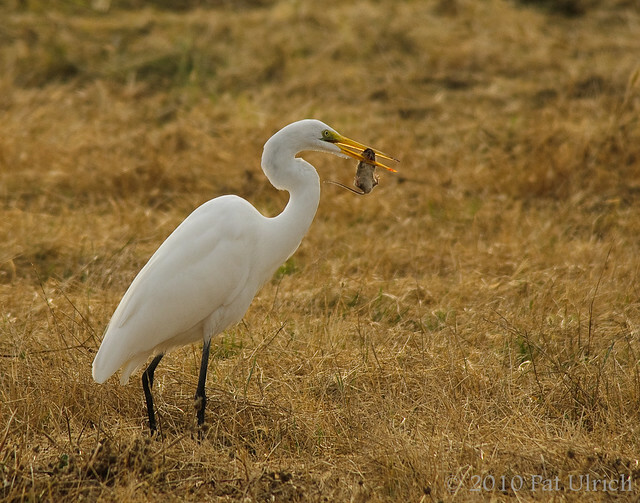 I haven't spent enough time yet around the grasslands and pasture lands in the area to know, but I wonder if the egrets in the Northeast also hunt rodents like the California populations do? 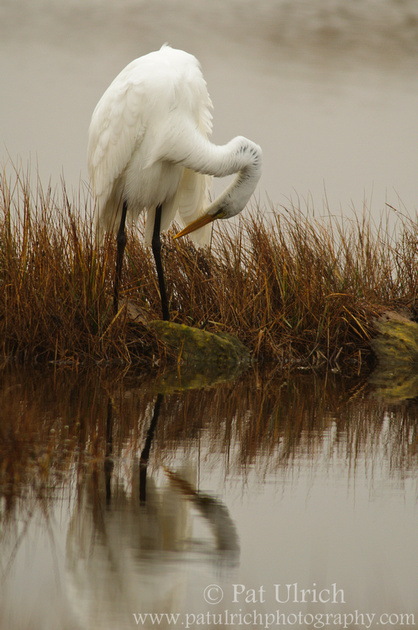 View more photos of great egrets in my Herons & Egrets Gallery. 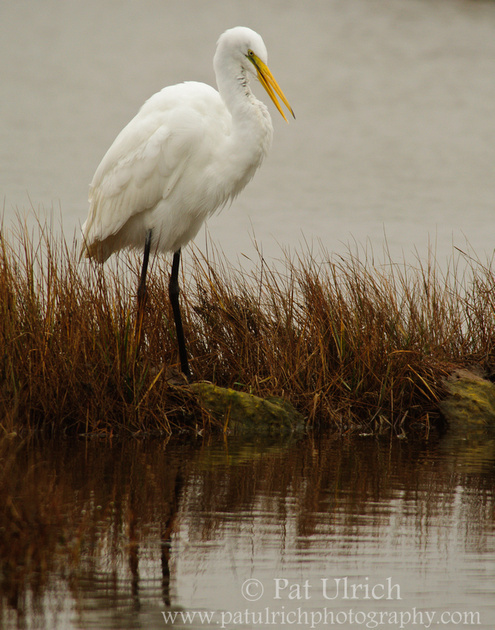 Submitted to the World Bird Wednesday blog meme -- Follow the link to check out this week's posts! I chose the day for my first trip to Parker River National Wildlife Refuge last month based on the forecast of a cloudy day. I really enjoy shooting under cloudy skies since it means nice even lighting during the day, and that I can shoot in reasonable light for more than just sunrise and sunset. However, my trip on this day was not the nice high clouds I was hoping for, but instead ground level fog and light rain all day. The birds didn't seem to mind though, and I was able to watch all kinds of waterbirds enjoying the weather. 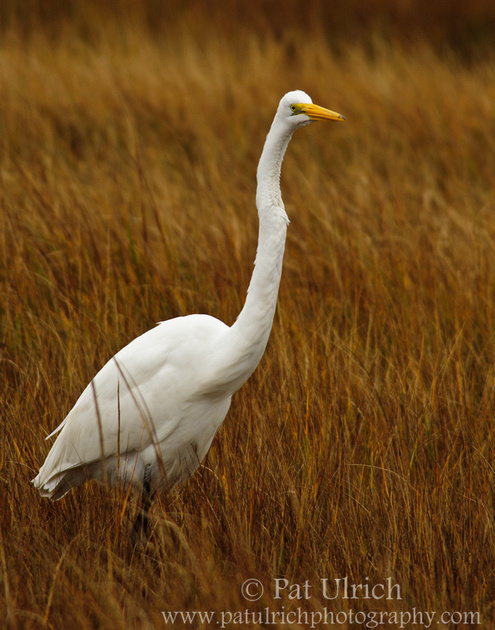 There was a large number of great egrets and snowy egrets in the marsh along the main road -- far more than I've seen on any of my return trips so far. 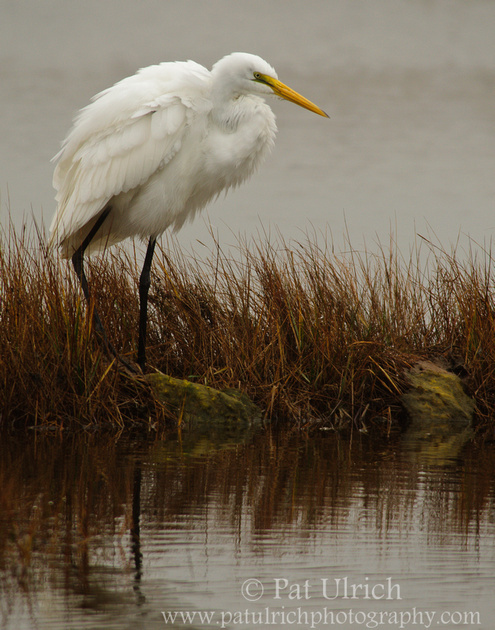 I enjoyed watching this great egret preen along the edge of a salt pond, and the feeling of the dreary day added a bit to the image I think. It wouldn't have quite the same mood if was under blue skies and direct sunlight, and I might not have been able to capture the same kind of reflection either. 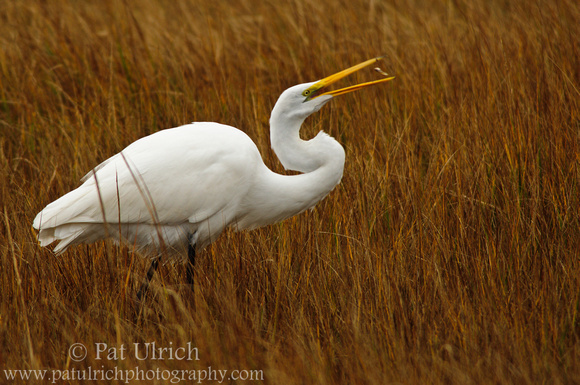 View more photos of great egrets in my Egrets and Herons Gallery. 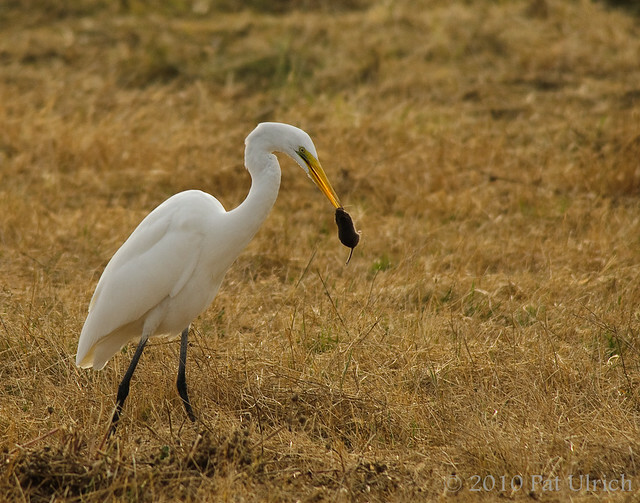 Two shots of a great egret capturing its prey in a field at the Ellis Creek Water Recycling Facility. Watching these birds stalk around fields is always interesting, as they stealthy move forward, very carefully placing each footfall. Then you know when they've spotted something, since they tend to crane their neck for a better view, as well as very carefully move to the perfect striking range. 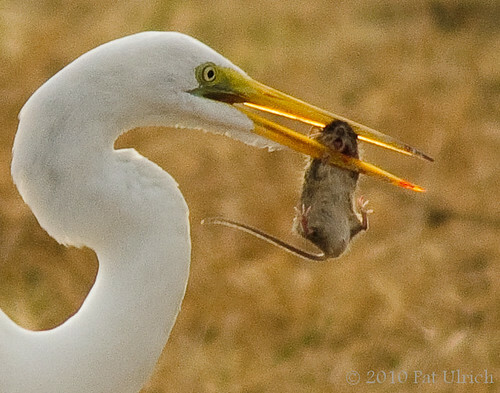 Before this encounter, I had never seen an egret catch something at this close range before. At the time, it didn't necessarily strike me too much emotionally, it was simply an experience with the necessary components of nature. Predators need to capture and consume prey to survive, and prey species do their best to avoid this fate. When I started reviewing the images though, I couldn't help but feel sad for the rodent. The expression it had while struggling for its life just moments before being eaten certainly struck a chord with me (a cropped version is below).